Seldom in the annals of publishing are authors afforded the opportunity to revise their contributions after thirty years. This is exactly what has occurred with "A Study of The Colt Single Action Army Revolver" since first published in 1976. This book now exceeds 600 pages and has remained the world's leading reference on this subject. This book encompasses all the variants of the Colt Single Action revolver manufactured between 1873 thru 1941. Although this is still the "same" book in many respects, much new fresh material has been incorporated. The text has been up-graded in many areas and a completely new color section added comprising of and consisting of thirty-one full color plates illustrating some of the rarest Colt Single Actions revolvers in existence. The refreshing new graphics will surprise those of you who have depended on former editions as a primary source. Comprising of three major sections, this book is co-authored by three of the most respected authorities in their field. Section 1 was written by Mr. Ron Graham who is well known in the Colt collecting fraternity as the leading authority on the pre-war commercial Single Actions. His knowledge and expertise in this field is recognized throughout the world. His detailed and seemingly miniscule observations of the various markings and changes which transpired throughout this production period are simply remarkable. Mr. John Kopec authored the center section on the Colt U.S. inspected Single Action revolvers. His expertise in this seemingly narrow area of Colt collecting is well known and respected throughout the Colt collecting world. This midsection of "A Study" delves deeply into the variants of the U.S. Cavalry revolvers and also encompasses the Militia & Artillery revolvers. Much new data has been compiled into this area of "A Study." Serial number ranges for the various ordnance inspectors have been up-dated. Drawing from a source of over 8000 individual listings in his data-base, Mr. Kopec has been able to pinpoint several areas where changes occurred and where deviations from the norm have now been proven to be correct. Many photographs and illustrations abound in this expanded section. The late C. Kenneth Moore authored the third portion of this book. Mr. Moore was meticulous in his approach, paying attention to the finest details. A massive search of the National Archives, Old Military Records, including a "hands-on" study of the Colt Archives records, together with a thorough research of the records located at the Connecticut State Library has resulted in this scholarly contribution. 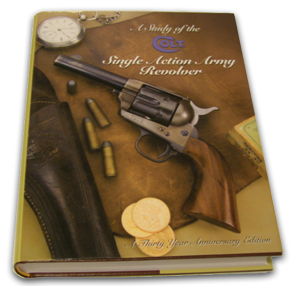 The detailed information available in these chapters will provide today's student of the U.S. Colt Single Action a reliable means to further research his own prized revolver. This book also features a complete detailed index, but best of all, a special "Serial Number Index" has been incorporated into this revised edition. This feature alone will save the Colt student countless hours in locating a particular serial number. 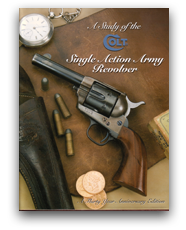 A Study of the Colt Single Action Army Revolvers is now available, hard bound with a beautiful dust jacket. A must for today's Colt collector.